"It's About the Rose" is the very impressive follow-up to Allure of Sanctuary, and sees Karen Marie Garrett at her creative and original best. 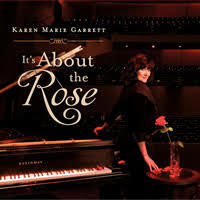 A year in the making, "It's About the Rose" features all-original recordings, and reunites Karen with the legendary Grammy-Award winner Will Ackerman as her producer. There must be something about the opening tracks of Karen's CDs. Just as "Tip-Toe Dancer" was my favourite cut of "Allure of Sanctuary", so the first track hits the mark on her latest offering. The curiously titled "It's About the Rose in the Vase on the Table" gets the CD off to a wonderful start. This piece just flows along so effortlessly; it could last all day and I would not tire of it. Karen tells how originally she struggled with this track, but was inspired by a story about childhood she heard. Karen says, "I heard an interview with Matthew McConaughey, who spoke of his childhood and a lesson his mother would impart to a boy caught up in life's little dramas. She'd remind him it's really "about the rose in the vase on the table". I loved both the thought and the image- and returned to the song, which suddenly fell into place for me." The track has a delightful melody, and rolls along without a hint of the troubles the composer initially encountered. Another favourite is the second cut of the CD- "Tally's Lullaby". Jointly composed with cellist Eugene Frisen (Grammy-Award winner), this is a mournful yet beautiful piece lamenting the passing of a fan's pet dog. This was in response to a letter Karen had received, explaining how "Simple Things" from "Allure of Sanctuary" had helped with the grieving process. Such is the power of Karen's music. Overwhelmed by the letter, the composer was inspired to write "Tally's Lullaby". The cello and piano are a partnership made in heaven in this piece, and I am sure Tally will be both relaxed and honoured in her final resting place. "The Piano Called" is a piece which warrants repeated listening, initially reminding me of "Toll of War" from "Allure of Sanctuary". It quickly takes its own direction, however. A simple, pretty melody on solo-piano is the end-result of an improvisation late one evening when Karen felt her creative voice calling. Another piece I really like is the album's fifth track, "Moon Night". Upbeat in comparison to other tracks, this is a spicy little number featuring Derrik Jordan on the djembe drum and violin. It conjures up visions of exotic settings. Perhaps that rose in the vase on the table has worked its magic, and romance is in the air. This is inspirational music, and has a Latin flavour. "Moon Night" is music to which to dance. "Waiting" is a piece born out of frustration, whilst awaiting the results of medical tests. The left hand is used to represent the passing of time (ticking of a clock). The right hand captures the anxiety of the moment. Yet still Karen delivers a memorable melody- its positiveness generated, one would expect, by the welcome relief of the eventual results. As Karen explains to me, "I used the dynamics of both hands to express the intense conflict in being caught in such confinement." Karen pays homage to both Beethoven and Chopin in Track 7, with "Beethoven, Chopin and the Rose". In the sleeve notes, Karen explains that she greatly admires both masters' works- "I wondered what it would feel like to combine an essence of both and yet retain a simple, touching melody". She certainly succeeds in doing this, and the end product is a lovely piece. Karen demonstrates once again that she is happy to draw upon her classical roots for inspiration. "Tip-Toe Dancer" was arguably the most-loved composition of "Allure of Sanctuary", and the title returns here in a different form as Track 9, "Tip-Toe Dancer and the Sea Pearl". This time we move away from the ballerina, to a young boy on the beach one Sunday afternoon, dancing and twirling in delight of his newly-found treasure. The music has a playful quality, and Steve Schuch's violin is a welcome addition to the piece. In Track 11, "Daydreams", the tempo is slowed right down. This is a reflective piece- music in which to immerse oneself in deep thought. Very beautiful, and with definite meditative qualities, Karen describes it as "a Summer idyll". A very simple track, and soporific in nature. The album fittingly closes with "Finale of the Rose", a resurrection of the first track, which is explored further by Karen, with additional instrumental accompaniments. Will Ackerman plays the hopi drum and chime bars, Jeff Oster plays the flugal horn, Steve Schuch returns on violin, and Derrik Jordan provides additional percussion. The end-result showcases the beauty of the original melody in its finest form, and is a fitting way to close the CD. "It's About the Rose" was recorded at Will Ackerman's Imaginary Road Studios in Vermont during 2006. 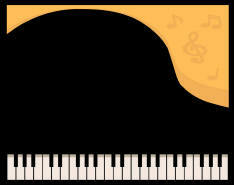 A Steinway Concert Grand was used for the recording. The sound quality and production values are, as ever, impeccable. With "It's About the Rose", Karen Marie Garrett shows continued artistic growth, revealing her creative qualities to the full, without losing that special gift for melody which makes her compositions so endearing to her ever-increasing legions of fans. A true gem of a CD- pure Piano Heaven. 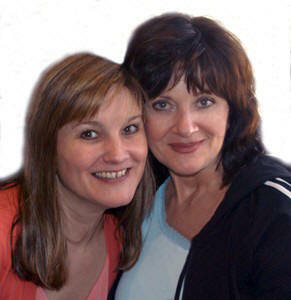 Karen Marie Garrett right with Anne Williams, host of Nightscapes Radio Programme (Boston).